The digital economy – the application of internet-based digital technologies to the production and trade of goods and services – is becoming an ever more important part of the global economy. The transition to a digital economy can provide a boost to competitiveness across all sectors, new opportunities for business and entrepreneurial activity, and new avenues to access overseas markets and to participate in global e-value chains. It also provides new tools to tackle persistent development and social problems. However, it comes with a host of challenges — from the global digital divide, to potential negative social and development impacts, and complex, internet-specific regulatory issues — which policymakers need to address. The opportunities and challenges associated with the digital economy are particularly important for developing countries. The digital economy has important implications for investment, and investment is crucial for digital development. First, the digital economy has the potential to transform the international operations of MNEs and the impact of foreign affiliates on host countries, and therefore affects investment policies. Second, digital development in all countries, and particularly the participation of developing countries in the global digital economy, calls for targeted investment policies to build connectivity infrastructure, promote digital firms and support digitalization of the wider economy. WIR17 looks at both perspectives in turn. Information and communication technologies (ICTs) have been a fundamental enabler of the growth of international production. The rise of the digital economy represents at the same time both an intensification and a disruption in the symbiotic relationship between ICTs and international production. An intensification in that it provides MNEs with more far-reaching opportunities to redesign processes and routes to market, and to redefine governance modalities in global production networks. A disruption in that it gives rise to entirely new multinational business models, from “born globals” to virtual MNEs, with fundamentally different international footprints. Digital MNEs (a new category) build on the infrastructure and tools provided by ICT MNEs. They include a variety of business models, including internet platforms, e-commerce and digital content firms (figure 14). The importance of digital firms in the MNE universe is also growing rapidly. WIR17 presents a new top 100 of digital MNEs and their international production footprint. Digital MNEs and tech MNEs have a relatively light international production configuration. They can reach foreign markets with limited assets and small numbers of employees overseas. 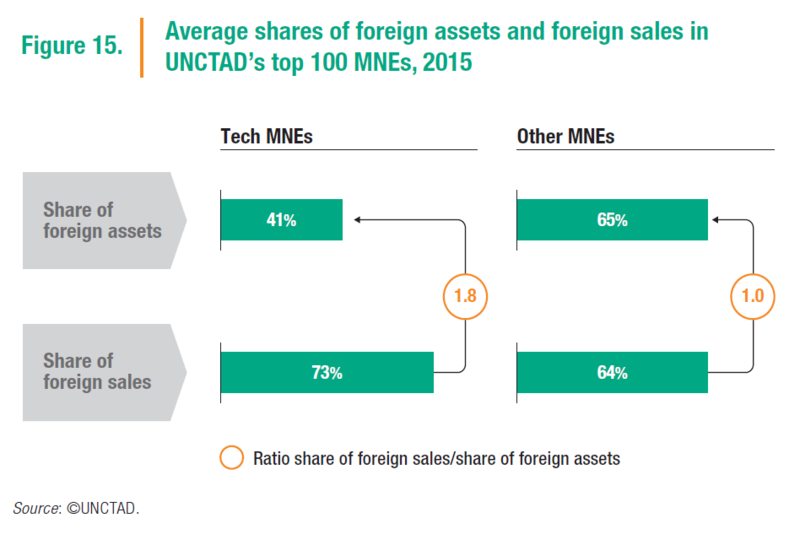 Whereas other MNEs report, on average, balanced shares of foreign assets and sales, tech MNEs make 73 per cent of their sales abroad with only 41 per cent of their assets based outside their home countries (figure 15). The higher the internet intensity of MNE operating models, the greater the disconnect between foreign revenues and physical assets. The largest internet platforms have a share of foreign sales about 2.5 times larger than their share of foreign assets. The economic impact of digital MNEs on host countries is thus less directly visible in terms of physical investment and job creation – although their investments can have important indirect and productivity effects, and contribute to digital development. Digital MNE headquarters are concentrated in a few developed countries and emerging markets. Their ability to operate globally with limited foreign investment could reverse the dominant FDI trend of the last decade towards “democratization” of outward FDI – back to concentration in few large home countries, in particular the United States. About two thirds of digital MNE parent companies and almost 40 per cent of their subsidiaries are in the United States, compared with 20 per cent of both parents and subsidiaries of other large MNEs. Tech and digital MNEs are having important effects on the values of both intangibles and liquid assets in international production. In 2015, the value of intangibles for tech MNEs (relative to the book value of assets) was double that of other megacorporations. Valuable intangibles and strong operating margins are driving large cash reserves in technology companies. At nearly 30 per cent of total assets, tech MNEs have more than twice the cash holdings of other large MNEs. A sizeable part of these cash holdings are retained foreign earnings. United States digital MNEs report a share of unremitted foreign earnings – at 62 per cent of total foreign earnings in 2015 – almost three times larger than that of other United States MNEs. The high value of unremitted foreign earnings and the low value of foreign tangible fixed assets (six times smaller) suggest that these resources are contributing relatively little to overseas investment in productive capacity. 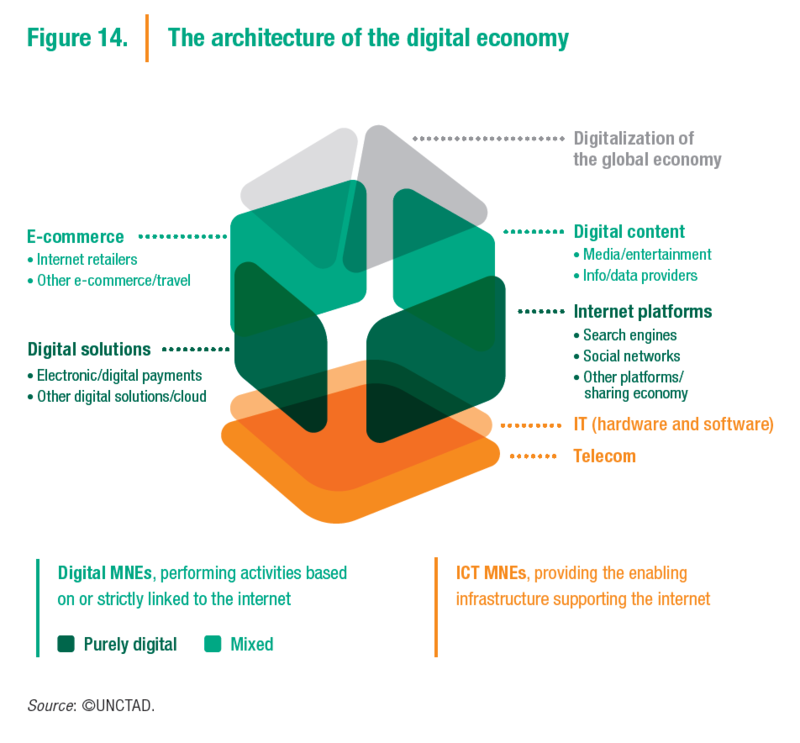 The digital economy is not limited to the ICT sector and to digital firms. Arguably the biggest economic impact comes from the digitalization of processes and supply chains across all sectors of the global economy. Digitalization can affect any process in the supply chain, including procurement, production, coordination across networks of operating units, outbound logistics and customer relations. The international production profiles seen in digital firms could be a harbinger of the future for many industries. They may represent the extreme end of a transformation process that could affect all MNEs, to varying degrees. To date, the impact of digitalization on the international footprint (foreign assets, sales and employees) of non-digital MNEs is limited, but a trend towards more asset-light forms of international production and alternative modes of governance has begun. Digital adoption in MNEs outside the digital sector can change international production in a number of ways. Different scenarios are possible, affecting the direction of international production trends (towards either more centralized or more distributed production), the nature of international production (the types of activities involved) and the impact of international production. For example, digital-twin production sites and 3D printing might lead to smaller investments in more countries. Conversely, big data and mass customization technologies might lead to fewer and larger production sites. Digital technologies are accelerating “servicification”, potentially increasing foreign affiliate activity in services, as well as in contracting activities and non-equity relationships. At the same time, the greater importance of technology and intellectual property in value creation can lead to the reshoring of some overseas contracting activity. Finally, disintermediation trends brought on by digitalization can lead to some sectors in host countries – for example, retailers and distributors – losing out. At the same time, new distribution partnerships are being created, with scope for new value added services. For investment policymakers, new actors on the international production scene and the evolving nature of MNE international operations have implications for strategic investment targeting. Their economy’s competitive advantages for the attraction of international investment may be different in a digital economy that relies less on some factors, such as low-cost labour, and more on others, such as skills and low-cost energy. This poses particular challenges for developing countries. Digital sector investments also have implications for policies and institutions for the promotion and facilitation of investment. For example, IPAs are usually measured on direct physical investment impact: productive assets created and jobs generated – less evident in digital sector investment. Furthermore, digitalization has implications for regulations governing investor behaviour. Investment rules designed for the physical economy may need to be reviewed in light of new digital business models. The same applies to sector-specific regulations. 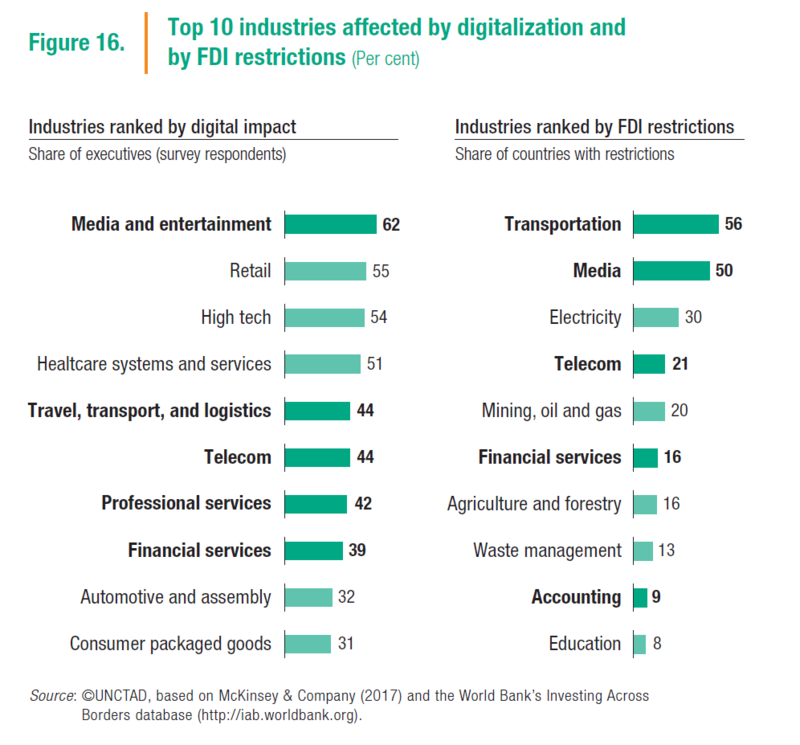 Many of the traditional industries most affected by digitalization – such as retail, media and (consumer) finance – are also those in which numerous countries maintain investment restrictions (figure 16). (As a consequence, there could also be implications for IIAs, because the same industries tend to feature in reservations in IIAs.) Moreover, digital MNEs are crossing industry boundaries and disrupting other highly regulated industries (e.g. transportation). Some analogue-era regulations may become obsolete (such as retail restrictions that risk being bypassed by e-commerce) or could inadvertently slow down digital adoption (such as sector regulations that effectively block new digital entrants); others may need adaptation to the digital age in order to achieve their public policy objectives. Finally, also at the international level, policymakers need to assess how evolving rules in e-commerce and services trade affect investment treaty making. Many countries have published, or are preparing, development strategies for the digital economy. WIR17 contains the findings of a detailed study of the investment dimension in more than 100 national and regional digital development strategies. Although the development of digital infrastructure and of a digital industry will necessarily involve significant amounts of investment in most countries – a fact acknowledged in a majority of digital development strategies – many strategies fail to address the investment dimension or discuss investment needs only at a very general level. 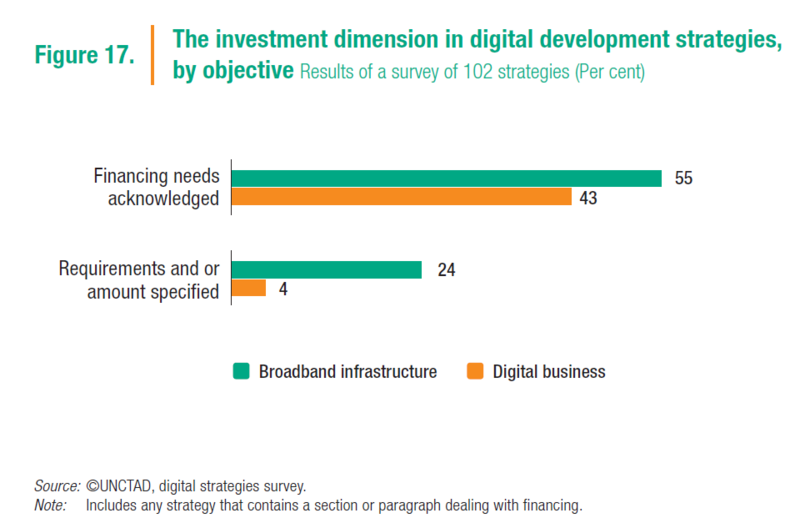 Less than 25 per cent contain relevant details on investment requirements for infrastructure, and less than 5 per cent on investment needs beyond infrastructure, including for the development of digital industries (figure 17). The results of a separate survey of more than 90 IPAs indicate the desirability of better policy coordination between investment authorities, on the one hand, and ministries and public institutions charged with digital development, on the other. IPAs are rarely involved in the formulation of digital strategies. Nevertheless, for most IPAs the promotion of investment in digital infrastructure and firms is a priority objective. However, only a minority confirm the availability of promotion or facilitation instruments for the digital sector. Digital development strategies that provide details on investment needs often focus exclusively on infrastructure (e.g. broadband coverage). A comprehensive digital development strategy should cover investment in digital infrastructure, in digital firms and in digital adoption by firms across all industries. Investment requirements to achieve adequate connectivity for most developing countries could be less daunting than often supposed: infrastructure investments to build universal broadband coverage (a prerequisite for achieving the SDG target of universal access) are achievable with an enabling framework for private investment and policies aimed at generating sufficient demand. To help policymakers fill a gap in digital development strategies, WIR17 presents a simple tool that can help produce an estimate for infrastructure investment needs. On the basis of this tool (which takes into account only basic 3G coverage for all), UNCTAD estimates the total investment costs associated with universal coverage in developing countries at less than $100 billion. Government support and forms of public-private partnerships will be needed for universal connectivity, including in thinly populated and low-income areas. Although telecommunication firms construct the bulk of networks and internet exchange points, attracting digital MNEs can help complete internet infrastructure (e.g. content distribution networks and data centres). Regional cooperation for investment in internet infrastructure can increase the attractiveness of infrastructure projects for international investors. With connectivity in many developing countries well ahead of usage, speeding up digital development requires a focus on investment in local digital content and services to increase demand. This should include stimulating investment in enterprise development by creating and maintaining a conducive regulatory framework for digital firms, and by undertaking active support measures, which may include establishing technology or innovation hubs and incubators; building or improving e-government services to lead the way, create demand for local developers and lower business costs; supporting venture capital funding and other innovative financing approaches, such as crowdfunding; and instituting skill-building programmes. Linkages with global firms can help, and the involvement of foreign investors in local digital firms can accelerate their growth, but developing the digital sector mostly means supporting domestic enterprise development, rather than promoting investment by digital MNEs. The greatest development value may well be in the digitalization of firms in non-digital sectors. Internet usage by businesses in developing countries is significantly behind that in developed countries. Promoting investment in ICT across all firms, as well as business linkages and participation in GVCs, should be an important part of digital development policies. 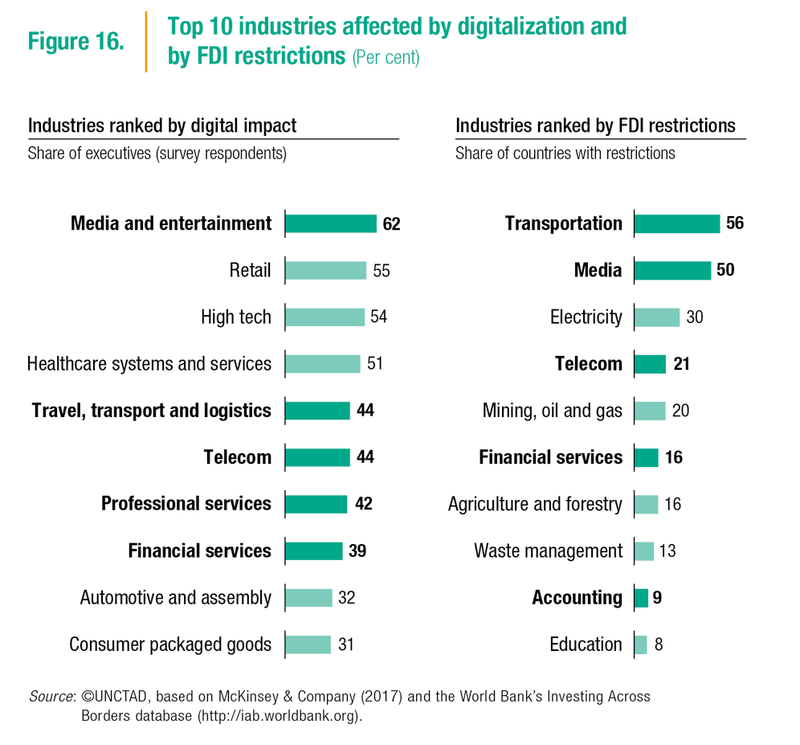 Digital adoption by firms requires investment in internet access, in devices and computers, and in relevant training. A number of factors will have an impact on investment decisions in this area. First, the policy environment for digital services is relevant for firms across all sectors, as all firms are affected by regulations on, for example, data protection and privacy. Second, tariffs and taxes on devices, and taxes on internet usage, influence the effective costs of ICT adoption. Facilitating access to cloud services can lower such costs. Skills development – potentially in partnership with global digital MNEs and their existing programmes for this purpose – is also important, to provide companies with the ability to efficiently adopt and use internet technology and services, and to enable local firms to interact digitally with MNEs and access e-value chains. While promoting investment in digital development, policymakers need to address public concerns. Doing so requires promulgating up-to-date regulations on such matters as data security, privacy, intellectual property protection, consumer protection and the safeguarding of cultural values. Where digital transformation causes disruption in other sectors or generates negative social or economic impacts, policymakers need to put in place policies to mitigate these effects. Overall, governments need to find a balanced approach that accommodates both public concerns and the interests of private investors. Given the important role of investment, including international investment, in the development of the digital economy and the transformative impact that the global digital economy will have on international production, it is important that policymakers take a structured and more proactive approach to investment issues in digital development strategies. 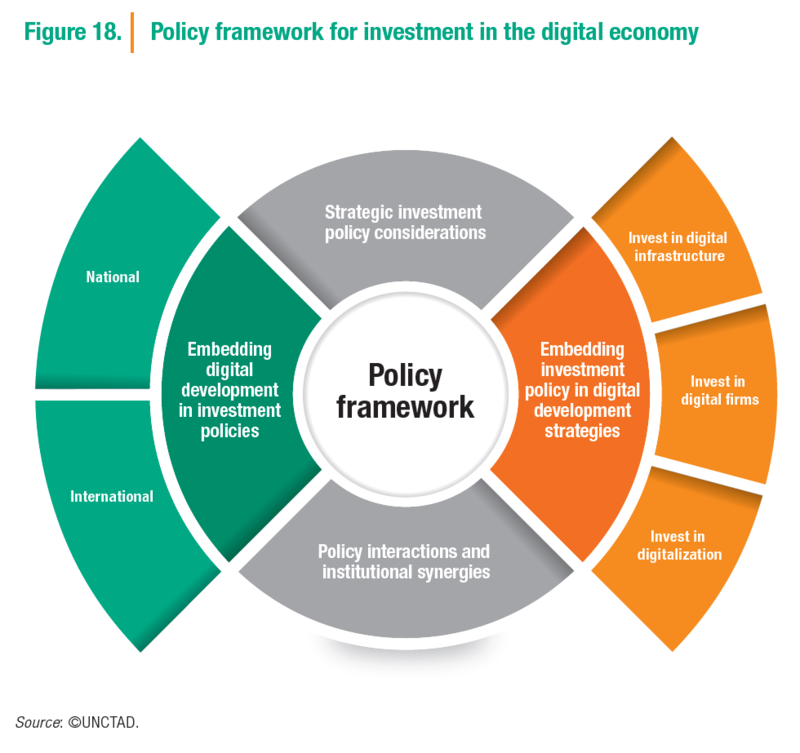 A comprehensive investment policy framework for the digital economy should ensure that digital development is embedded in investment policies and that investment policy is embedded in digital development strategies (figure 18).